Yoga is one of the most ancient and effective ways of keeping the body and mind fit and healthy. As a result, many people today practice yoga on a regular basis. 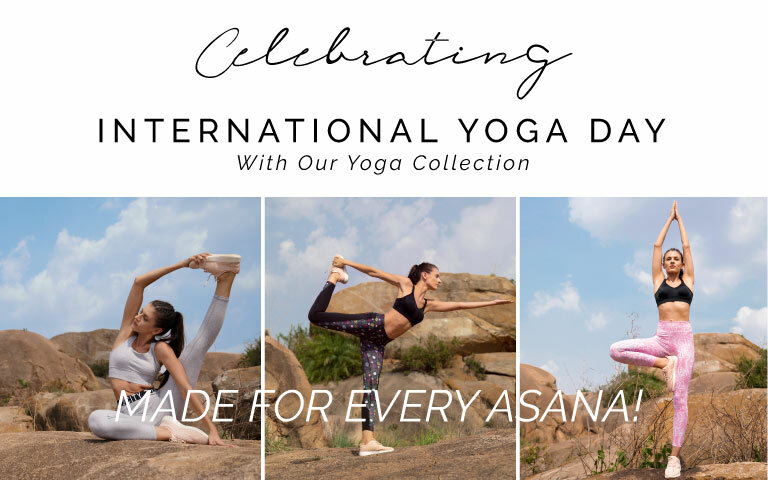 Understanding this healthy habit, Zivame brings forth smart and elegant yoga clothes online in India. The yoga dress collection by Zivame is designed for different types of wearers. Zivame knows that for effective yoga postures, the clothes worn need to flexible and comfortable. Thus, the brand introduces assorted yoga pants and tops for different kinds of yoga asanas. The yoga dress collection by Zivame allows freedom of movement and also prevents skin irritation. You can wear them for all kinds of exercises. They are designed to add support and do work out sessions bit more hassle-free. From well-fitted sports bras to great support for your legs, you will come across high-quality yoga wear at Zivame, at reasonable rates. So, if you are planning on buying yoga dresses, have a look at the options in yoga dresses that you can find on Zivame. Sports Bras: If you are looking for smart sports bras for your yoga classes, check out the stylish designs by Zivame. We are sure you will find your perfect sports bra. Here, you can choose from High Impact Sports Bra, Padded Sports Bra, Cross Back Sports Bra and much more. Pick the one that best suits your style and indulge in some power yoga. Leggings: From long length to Capri, leggings are the perfect fit for all kind of yoga postures. They are the stylish add-ons to your Pilates. Choose from abstract prints, solid colours, floral prints and more. Zivame introduces smart and elegant designs in both easy movement leggings and training leggings. Go through our collection and pick the one that you love. Made of spandex, Zivame leggings represent quality material at affordable rates. Tops: Yoga tops are the best way to show your flexibility while looking smart and casual. Some tops are to be worn over your sports bra, while some others can be worn while performing yoga. The wide arrays of yoga top designs introduced by Zivame are Skin Fit Tank Tops, Training T-Tops, Fitted Jackets, Full Sleeves Skin Fit T-Shirts, Cotton Hooded Tops, Sweat Shirts and more. With bold colours and flexible fabric, these tops are sure to keep you comfortable and relaxed all throughout. Since its inception, Zivame has always strived to provide quality products at affordable rates to its customers. They believe that comfortable clothing plays a vital role in keeping the individual relaxed and stress-free. This idea stands true for their yoga dress collection too. Apart from yoga dresses, the brand also offers different types of bras for women, different designs in sleepwear, assorted prints and high-quality fabrics. Zivame has never compromised with style or quality. So, go ahead and browse through the amazing collection of lingerie and apparels offered by Zivame and create your own style statement. Your trendy comfort wear is just a click away.